IBM MobileFirst for iOS Rapid Handover empowers foremen to quickly and easily record essential activities and use predictive analytics for key decision making. 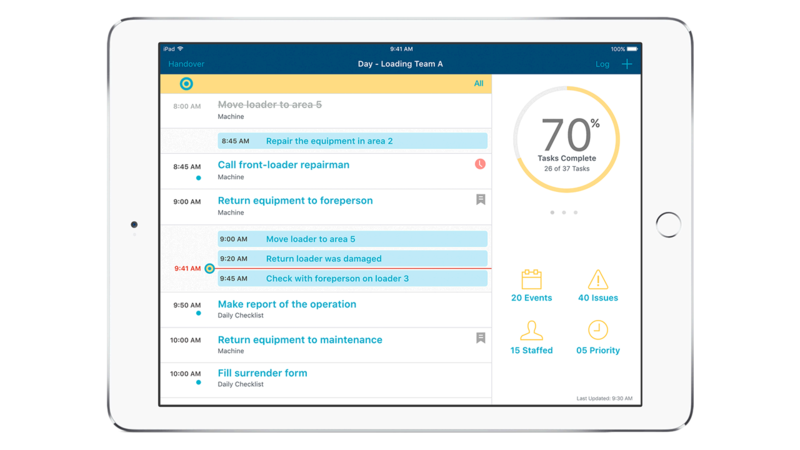 IBM MobileFirst for iOS Rapid Handover empowers foremen to record essential activities and use predictive analytics for better decision making. Foremen struggle to keep productivity up and gaps in communications down as they move on and off their shifts. Many foremen rely on spreadsheets and verbal directions to act on critical details – which can lead to increased production time, errors and safety risks. Rapid Handover’s mobile flexibility and built-in analytics can help foremen provide a more informative and productive shift transition for everyone. Rapid Handover provides real-time shift data. The app captures and prioritizes a list of all completed and open tasks from the previous shift. Foremen can quickly identify shift performance, equipment status and correlated constraints through the app’s single portal – keeping their team informed of pertinent activities. Make decisions on the go around safety and productivity improvement – reducing errors and downtime in production.